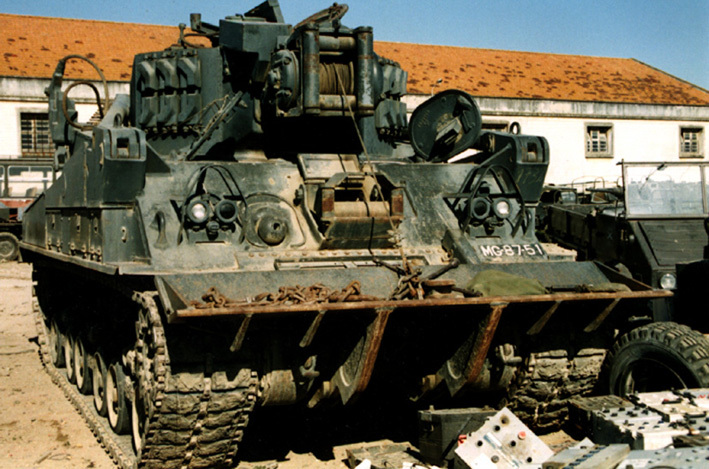 In 1954 Portugal received at least fifty Grizzly tanks. They were declared obsolete in 1973. Many were bought by collectors in the 1980s and today the Grizzly (of which orginally only 188 were built by Montreal Locomotive Works) is among the most numerous running Shermans. Together with the Grizzly tanks, Portugal received some forty Grizzly APCs (see Kangaroos). Only 5 or 6 were used by the Portuguese Army for driver training and the rest of them sat idle in a Lissabon army depot. In 1995 they were finally sold as scrap. 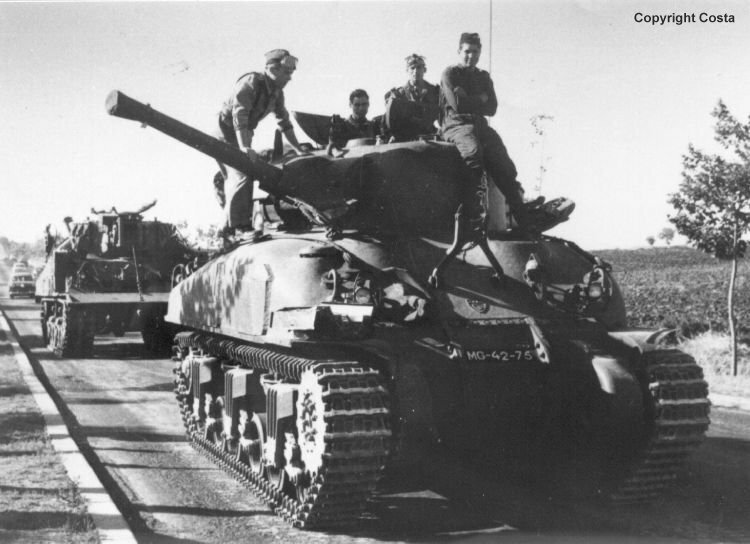 In 1953 the USA also supplied a number of Shermans under the MDAP. 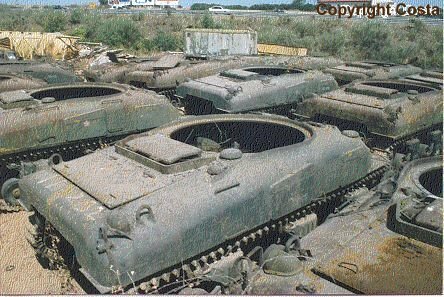 These included one M4A1(76)W HVSS, six to eight M4A3(105) HVSS and a number of Sherman dozer tanks. 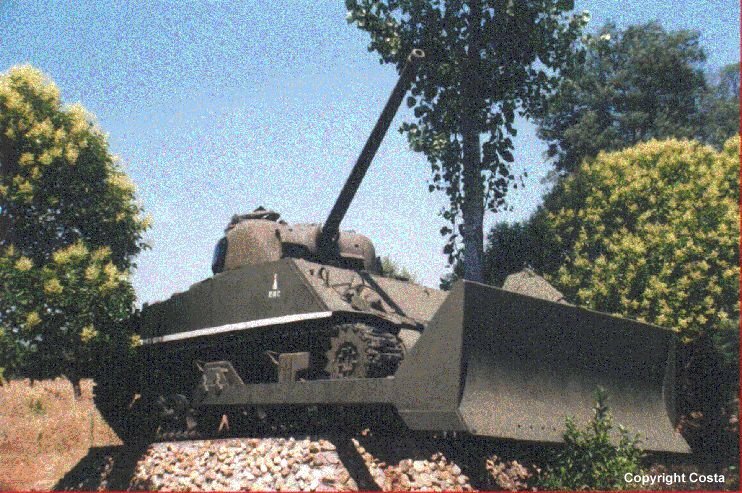 These were M4A3-E4 76MM Shermans (retrofitted with 76mm guns - one of them was retrofitted with HVSS as well). A surviving example is shown on the left. Portugal bought its M74 TRVs from Spain. A number of them were retrofitted with NAPCO repower packages, believed to have been supplied during the 1980s. Probably this modification was carried out on a small number of M74s only, as by the late 1980s/early 1990s the M88A1 TRV replaced the M74 in service. Engine: Ford GAA V8 petrol or Detroit Diesel Co. 8V-71T liquid-cooled, two-stroke, 9.32 l., 347 kW (rated power) turbo-charged diesel engine. This engine is mounted in an integrated unit that includes a complete cooling system, clutch assembly and clutch housing, engine electrical system and an alternator, the air cleaner, and intake and exhaust ducts. 'Collections. Portugal: Santa Margarida'. Wheels & Tracks, no.51, April 1995, p.46-47. Cullen, Tony and Foss, Christopher F. (Editors), Jane's AFV Systems 1989-90, London: Jane's Yearbooks, 1989, p.244. Scans courtesy of Collection Luis Costa (Grizzly and M4A3) and Roberto J. Flores Yoldi (M74).